Estadio Monumental Isidro Romero Carbo sometimes still referred to as Estadio Banco Pichincha after the former sponsors is a football stadium located in Guayaquil which is the largest and most densely populated city in Ecuador. Situated within the small parish of Tarqui, the 1987 built stadium has a 59,283 capacity which makes it the largest in the country and 12th largest in South America. Estadio Monumental first opened on 27th December 1987 with an inaugural match held against Barcelona SC’s namesakes, FC Barcelona from Spain. Playing in front of a sold-out 55,000 capacity audience, the home side defeated their Catalan visitors 2-1, in a star studded ceremony attended by three time World Cup winner Pele who’s famous words adorn a golden plaque inside the stadium. Upon seeing Monumental de Barcelona for the first time the legendary Brazilian remarked that “If Maracanã is the largest stadium in the world, Monumental is one of the most beautiful in the world”. Previously Barcelona had played their home matches at Estadio Modelo Alberto Spencer Herrera which first opened in 1959 and was shared by several clubs, which made it never feel like a proper home. More less always referred to amongst fans as “Monumental”, it officially opened as “Monumental de Barcelona” back in 1987, but five years later it became “Estadio Monumental Isidro Romero Carbo” in honour of the president presided over the ground’s construction. On January 2nd 2008 it was announced that Ecuadorian bank Banco Pichincha had purchased the naming rights on a six year deal. Known as “Estadio Banco Pichincha” until 2014, the stadium underwent expansion between 1992-1994 culminating in the capacity becoming the largest in Ecuador, reaching 75,000. 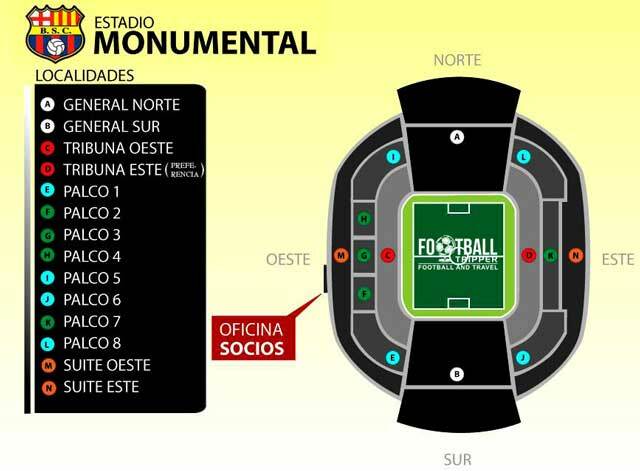 For International and South American fixtures which generally require a maximum of 2.5 people per meter, Monumental’s capacity is reduced to 57,000 although the Ecuadorian National Team usually play at Estadio Olimpico Atahualpa.